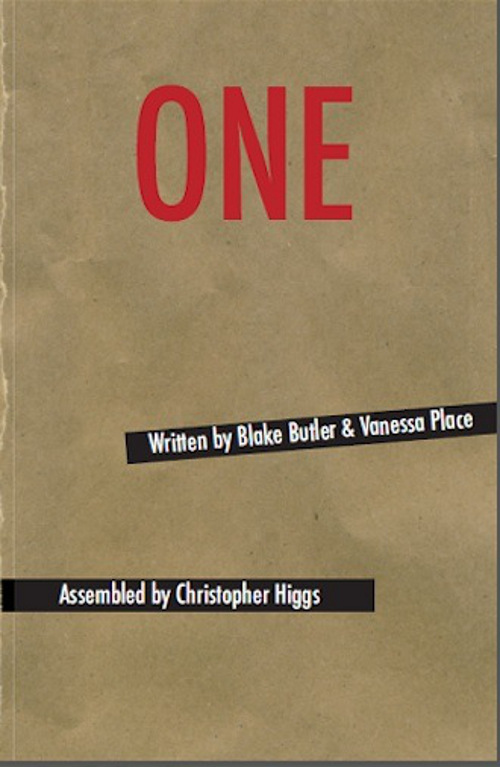 One, by Blake Butler and Vanessa Place. Assembled by Christopher Higgs. New York, New York: Roof Books, 2012. 150 pages. $16.95, paper. One is perhaps most notable for what it is; a unique collaboration between three writers. Blake Butler and Vanessa Place were assigned the tasks, respectively, of writing the exterior landscape and interior landscape of a single character. They were not allowed to collaborate or communicate at all with each other about their projects. Once they had finished, the products of their labor were delivered to Christopher Higgs who played, as he himself says in his introduction, Dr. Frankenstein to the bodies of their texts. Of late it seems as though people are ever more interested in the author, and in the closeness of a book to the author’s real-life experience. Memoir is a popular genre—perhaps because reality television and the cult of celebrity have driven us towards ever more voyeuristic pursuits, or perhaps because memoir means that anyone who’s managed to be alive for a while has a story to tell, free from any requirement of imagination or invention. Either way, memoir enacts psychoanalytic reading upon itself. We expect the author to tell us what is happening to them and within them so that we can feel immersed in the truth of their experiences. Memoir often follows the arc of trauma, trial, and recovery. For example, the death of a loved one or an abusive childhood, followed by a period of travel, drug use, law-breaking, or cult membership, followed by a recovery of normalcy that culminates in the author’s readiness to share his or her story. The redemption or recovery that concludes a memoir involves the revelation and understanding of the unconscious forces that drove the author into suffering his or her trials. Apparently, popular literature isn’t much for Anti-Oedipus. One on the other hand wants to be full on A Thousand Plateaus. One‘s conception suggests an amalgamation of Robbe-Grillet’s Jealousy, which was solely the exterior, or Beckett’s Unnamable, which was only ever the interior. While this equitable split of “what is happening outside of me” and “what is happening inside of me” is the basic requirement of memoir and encourages us to indulge in the most heterogenous psychoanalytic reading, One promises both a resistance of psychoanalytic reading (of the author) and a new conception of the construction of a psyche (for the character). But One never really delivers on this promise. The book reads like a fever dream of abstraction, and I imagine that if this text came pouring out of one of his patient’s mouths, Freud would probably become sexually aroused. While reading, it seemed as though the only possible grounding could come from trying to apply a psychoanalytic framework. There is here and there an allowance for something concrete. For instance, the book spends some time recounting legal history (which is much more interesting than it sounds at first blush—a bit Europeana in flavor), and occasionally visits a childhood moment. These aren’t irrelevant moves, certainly, but even though they are some of the few concrete elements of the book they do not act to ground the reader. There is no ground in One. It may sound like I’m creating an arbitrary interpretational structure against which to judge this book, but due to the nature of the book’s content the only way to attempt to read the character of One with any surety is psychoanalytically. Otherwise, the book becomes an entirely critifictional enterprise, and there’s simply not enough “criti” in the content—regardless of the intent in its creation. I found myself trying to distinguish between the interior and the exterior in a vain attempt to find some foothold as a reader. Instead this text insists that I simply allow it to wash over me, much like Deleuze and Guattari’s stated intention with A Thousand Plateaus. There’s certainly beautiful language, and vivid and striking imagery, but very little coherence. Intentionally very little coherence. And that feels like the safe move. It seems strange to describe anything about this book as safe, but nonetheless embracing abstraction to the degree all parties involved did seems like a hedge against potential conflict, just in case any distinct details either writer might offer conflict with the other’s. But perhaps that concern would have been better left in the hands of their Dr. Frankenstein. Also, conflict might have provided texture, a break from the slurry of images and ideas. I know abstraction is Butler’s milieu of late, but then I wonder why he enlisted two other authors for this project, and whether there would have been any tangible difference in the comprehensibility of the result had he not. The final house inside is pink: the pink of ash burned twice and smeared onto the face of a new child: thus, not pink, but the mask above it in negation; a color of a color set beside itself. One never wanted for anything but everything. One believes that if the artist is beautiful, no one will notice about the art. One believes in the abstract profundity of abstract profundities. One believes the less said the better. One is an interesting project in both conception and execution, but separately. The execution, while clearly expertly done and allusively rich, makes the conception feel oddly unimportant. If not for the fact that the book opens with an explanation, a reader might not think that he or she were reading anything other than a singular author attempting to follow in Beckett’s footsteps. The conception, of the disparate interior and exterior lives of a person integrated by a third consciousness, is supremely fascinating, but never particularly apparent in the final text. I expect this is not the only example of this sort of experimentation we will see, nor would I want it to be—this is the ideal situation in which to apply Beckett’s famous advice from Worstward Ho. Will Kaufman’s work has appeared most recently in 3:AM, Sundog Lit, Metazen, and SmokeLong Quarterly, with more coming soon fromBourbon Penn and Bartleby Snopes. He has an MA in Creative Writing from UC Davis, and an MFA from the University of Utah. You can find out too much here.